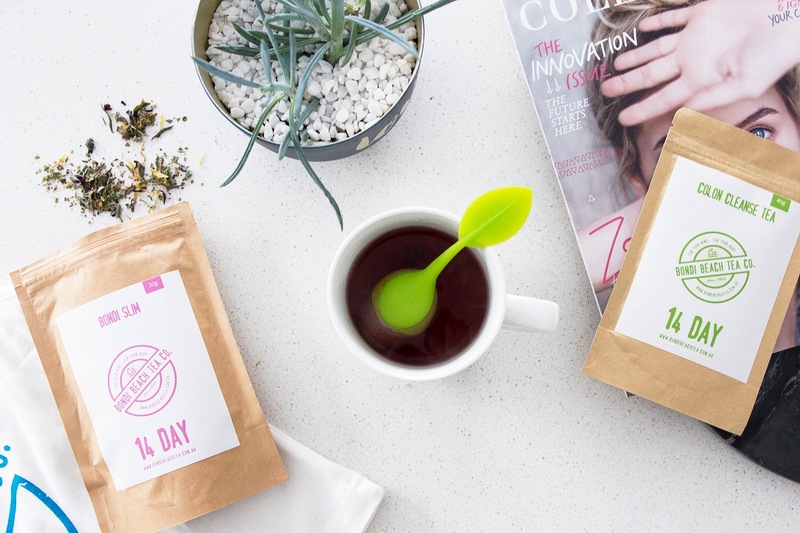 I know a lot of people sit on the fence when it comes to these teas and can be a little skeptical thanks to the big outrage that came out a few years ago now about these "weightless" branded teas putting laxative-type ingredients in their products. Thanks to the uproar that was caused by this, I find it's super rare to find a good brand of detox tea that uses anything like that anymore; in fact more and more are aiming to create these teas to be as organic and as natural as possible. One of those brands is Bondi Beach Tea, who sent me a few of their teas to test out, so today I'm going to share my honest thoughts on them with you. 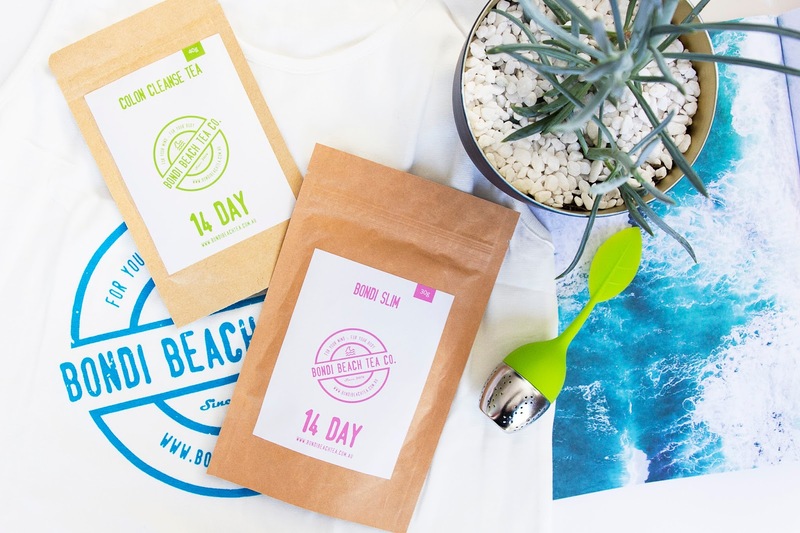 I received the Bondi B-Slim Detox 14-Day Program which contains a sachet of the Bondi Slim Tea and the Colon Cleanse Tea. For each tea you simply pop a teaspoon or two into a strainer (the lovely people from Bondi Beach Tea also sent me one of their adorable Silicone and Stainless Steel Leaf Tea strainers), pop the strainer in your cup and fill with hot water. Let the tea brew for 5 - 20 minutes depending on how strong you prefer your flavours to be, and then enjoy. With both teas I found a few of the little leaves and herbs would escape from the strainer, but would settle on the bottom of your cup meaning you won't end up getting a mouthful of herbs at any point. I'm going to quickly list the ingredients in both teas, so you can see for yourself there's no nasty laxative-type ingredients hiding in there waiting to upset your stomach. 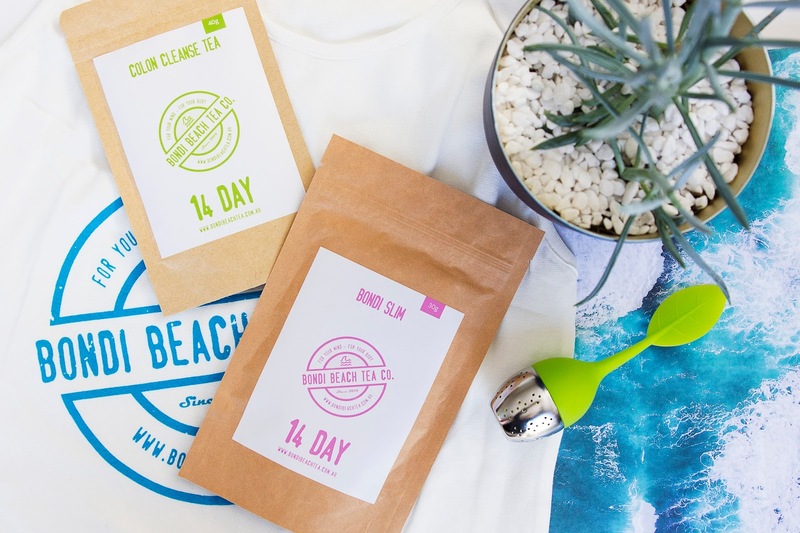 The ingredients for the Bondi Slim Tea are yerba mate, hibiscus, Garcinia cambogia, dandelion leaf, green tea, acai berry, schizandra berry and calendula. 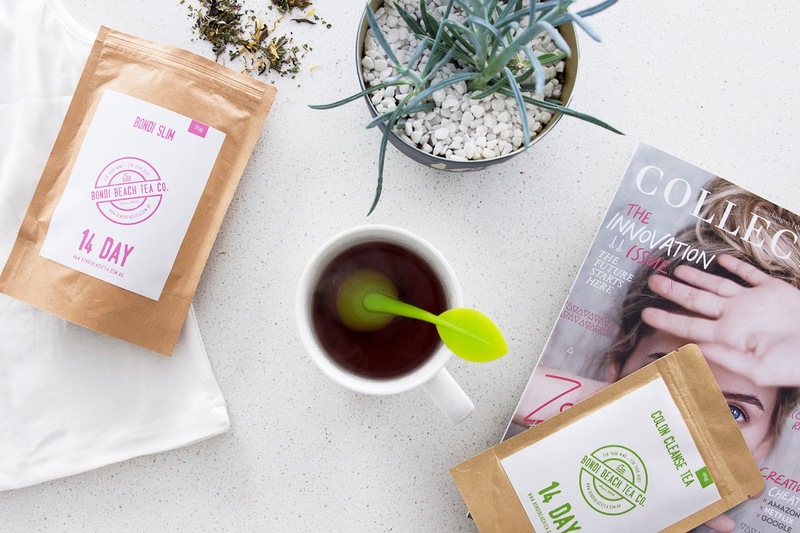 The ingredients for the Colon Cleanse Tea include flaxseed, rooibos, cinnamon, dandelion root, liquorice root, cacao nibs, fenugreek and rose petals. The next big thing with teas like this is taste! I personally love the taste of the Bondi Slim Tea. The brew turns a nice red colour, and for me something red always signals something that's going to taste great. It has a nice summer berry flavour to it, but it's nothing to sweet or over powering. The Colon Cleanse Tea however was a flavour I wasn't a fan of. As soon as I smelt this tea as it brewed I knew it wasn't going to be for me. It's hard for me to describe the flavour, but it was a bit of a weird bitter taste that really lingered in my mouth, so unfortunately I wasn't really able to drink this one because my taste buds just weren't having a good time. I guess the last main question people have about products like this is, did it work? Obviously I can't give you a real review on the Colon Cleanse Tea because I wasn't able to stomach the taste, but I can have a little chat about the Bondi Slim Tea. Obviously these teas aren't going to work wonders on their own. You need to also be keeping a good balance with your diet and exercise to be feeling healthy, but a detox tea like this can help to give your system a little boost. While I didn't suddenly feel drastically different or healthier, I did feel, when I was remembering to drink this regularly, that I was waking up and generally feeling less bloated, which does result in my stomach looking a flater throughout the day. Also, I did just love the flavour of this tea, and it was quick refreshing to start my day with something a little different to my usual black tea. Products like this, I feel, are something that will be different for each individual because our bodies and the way they operate are all a little different. If you have been considering giving something like this a go, flavour wise, I would certainly recommend giving the Bondi Slim Tea a test. Bondi Beach Tea also have a range of other teas that you can buy on their website, which may also be of interest to you. I’m definitely one who usually sits on the fence about these, but these actually sound really interesting! I love that they both contain Dandelion Root! It's so helpful in eliminating toxins from the body, which I'm sure to contributes to the reduction in bloating that you experienced! Beautiful tea strainer too.